In the early days of the 19th century the inhabitants of British Honduras felt that their territory would amount to something and that it was here to stay. They wanted to build streets and public buildings, a church, maybe even a school. Consequently they voted for taxes on a number of items that were imported such as liquor, tobacco and slaves. In 1810 Colonel John Smyth, the then Superintendent, appeared before the Magistrates to discuss the “considerable amount of contraband goods that was said to be landed and vended in the Settlement”. On June 6, the Magistrates asked him to issue a proclamation, “prohibiting the introduction into the settlement from the USA all articles except provisions, lumber, livestock, tobacco, pitch, tar, turpentine and resin”. They also proposed to advertise the post of Searcher or Boarding Officer to enforce the law. On 9 June, 1810, the post was filled; his instruction was that he boards every vessel from the USA on anchoring; remain on board all day until she discharged and to secure the hatches and bulkheads every night. 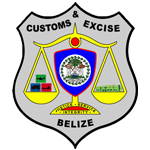 Belize consequently had its first Customs Officer. This officer reported to the Public Treasurer who was responsible for the Treasury, the Post Officer and Customs. In February 1852, London suggested that an Excise Tax be levied on rum made in Corozal and Orange Walk by the newly arrived refugees of the Caste War of Yucatan. Nevertheless, it was not until 1856 that the Public Meeting passed the first Excise tax on rum and sugar made in the north. By 1856 shipping in and out of Belize City amounted to about one vessel every three days, and the then Superintendent, William Stevenson, reported to London that inefficiency, fraud, and smuggling required immediate consideration. As a result, a Collector of Customs was appointed to administer Customs and Excise functions. Mr. Chas Huyter was the first Collector of Customs, and he held that post from 1856 until 1861. The post of Collector was upgraded to Comptroller in 1955, and Mr. H.J. Sabben was appointed as the first Comptroller in that year. OUR MISSION: To ensure safety and security and to contribute to the economic development of Belize by enforcing the customs and excise laws, assuring operational integrity, facilitating legitimate trade, collecting and safeguarding the revenue, protecting the environment, combating smuggling and illicit activities, and promoting and upholding fair trade practices through the efficient and effective use of modern tools and information, while fostering cordial relations with stakeholders, and valuing and respecting our human resources.